This document covers the general guiding principles of PAKDD, submission and no-show policies, and guidelines for running a conference. These guidelines were codified by Graham Williams on behalf of the PAKDD Organizing and Steering Committee in 2007 and updated over time as a recommendation for adoption by future PAKDD Conference Organizers. The Steering Committee Rules capture the requirements for the non-tax status of a scientific organization in Australia. These rules were endorsed by the Steering Committee in June 2006. Below, “the organisation” refers to the PAKDD Steering Committee. The PAKDD Steering Committee is an association of scientists, whose primary purpose of association is to encourage the scientific pursuit of research in data mining in the Pacific Asia region. The committee has oversight of the annual Pacific Asia Conference on Knowledge Discovery and Data Mining, through the selection of hosts, guidance, if required, in the running of the conference, and provision, if requested, of seed money and money for awards and support of attendance at the conference. The target size of the Steering Committee is 15 with a distribution of representatives from countries of the region. For clause (a) a quorum of half of all Steering Committee members is required. For clause (b) a quorum of two thirds of all Steering Committee members is required. This option will be used to maintain a balance of countries. Voting will be completed within 2 months following each year’s PAKDD Steering Committee meeting. Voting will be conducted by the Steering Committee Chair and all votes will be to the Steering Committee Chair who will maintain anonymity of the votes. Voting will be held by email and will allow 7 days from the calling of the votes for members to email their votes. In each case there is a maximum of two new members each year (so that there could be a maximum of four). The number added each year depends on positions available. The term of a Steering Committee member is 3 years with up to two renewals (to a maximum term of 9 years). For a new member appointed under 3 (a) the member is regrarded as having served one year (having organised the conference). A Steering Committee member must attend at least one of the three PAKDD conferences in their first term to be eligible for a first renewal. A Steering Committee member must attend at least two PAKDD conferences in their second term to be eligible for a second renewal. Any Steering Committee member who does not attend a PAKDD conference for 3 consecutive years will be deemed to have then completed their term as a Steering Committee member. served two terms (6 years) and have served as the Steering Committee Chair for at least 3 years. A life member is not obliged to attend any PAKDD conferences and will hold this membership for life. A life member can only vote for new members if they have attended the PAKDD conference that year. The assets and income of the organisation shall be applied solely in furtherance of its above-mentioned objects and no portion shall be distributed directly or indirectly to the members of the organisation except as bona fide compensation for services rendered or expenses incurred on behalf of the organisation. In the event of the organisation being dissolved, the amount that remains after such dissolution and the satisfaction of all debts and liabilities shall be transferred to another organisation with similar purposes which is not carried on for the profit or gain of its individual members. The scope of PAKDD and the required format and page limitations are indicated in the Call For Papers of PAKDD. The paper must fit the scope of PAKDD. The paper must be original, and must not be published or under consideration to be published elsewhere. The verbatim copy and/or reuse of material (text, formula, graphics) from other published papers (either by the author or by other authors) without explicit citation, is considered to be plagiarism. Quotations should be clearly identified and include the appropriate citation. For example, “According to Smith and Jones (2007) ‘……'”, or “‘……’ (Smith and Jones, 2007). When a new submission is based on the authors or on another author’s previously published works, the citation of the previous works should be clearly given in the new paper. Furthermore, the novel contribution of the current paper, which extends the previous works, should be clearly indicated. This policy on plagiarism for PAKDD has benefited from the guidelines on how to handle plagiarism statement developed by the IEEE. Withdrawal, before proceedings are finalised. If none of the authors register for the conference/workshop before the required deadline, prior to the proceedings being finalised, the paper will be deemed as being withdrawn from the conference, and will not be included in the proceedings or the conference program. If the authors fail to inform the conference organiser of their change in circumstances and are not available for the presentation of their paper, the conference will inform the authors’ organization. In addition, if the authors have a record of bad faith no-show with previous PAKDD conferences, the proceedings will not be made available to the authors, and future submissions to PAKDD conferences by the authors will be barred for up to three years. The PAKDD Steering Committee provides oversight of the PAKDD series of conferences. Conferences are generally run autonomously, with reference to the steering committee for guidance. The following guidelines aim to capture the common understanding between the steering committee and the conference organisers. The PAKDD conference series aims to support the emergence of KDD research and technology in the Pacific and Asian regions. The conference locations are spread throughout the region. Whilst there is no explicit rule regarding location the general principle is to move through the region from China, Japan/Korea, Southeast Asia, South Asia, Australia/New Zealand, and the Pacific from year to year. The next year’s conference is announced at the current conference’s banquet dinner. Any decision regarding the conference two years hence is not announced nor confirmed until it is only one year hence, when the General Chairs, PCs, and invited speakers are expected to have been line up. Proposals are considered at the Steering Committee’s annual general meeting hosted by the conference. The bid for the coming year’s conference is considered and the steering committee makes their final decision on which bid to proceed with. This will then be announced at the conference dinner. Proposals for more than just the following year are also welcome and encouraged. This allows the steering committee to review the proposal early and to provide feedback for the final bid. A $5000 (USD) seed grant is available on application to the PAKDD SC Chair. The seed money is to be repaid to the PAKDD SC at the conclusion of the conference, before any surplus is calculated. If a conference makes a loss (which has not occurred) the PAKDD SC can decide to underwrite that loss up to an amount of only $5000 (USD). If seed money was provided for the conference, the maximum amount of support for any loss will be reduced by the amount of the seed money provided. If the conference ends up raising funds in surplus (the only situation we have had so far) the surplus (after returning any seed money) is split 50/50 with the PAKDD SC. Such funds are only to be used for the benefit of the conferences into the future, in line with the Steering Committee Rules. A registration fee of approximately USD $550 (early bird) is the target. A student fee of USD $350 (early bird) is also suggested. This covers conference, workshops, and tutorials. For particular locations, the conference organisers may decide to charge a smaller fee for local registrations to encourage local participation. Workshop-only fees (for example USD $180 early bird) may also be appropriate, but we do want to encourage attendees to stay on for the whole conference. The Steering Committee recommends that a recognised international researcher in data mining be appointed as the Program Committee Chair. Their role is to encourage international participation in the conference and ensures the ongoing credibility and integrity of the conference. Co-chairs will also be appointed by the particular conference organisers. One of the co-chairs will be identified as responsible for the administration of the paper submission and review system. The organisation and program committees for the coming year’s conference should be agreed to by the steering committee, finalised and confirmed by the time the conference is announced at the conference banquet. PAKDD uses the following process for all invited speakers and especially those for whom financial support is provided e.g., airfare and accommodation). This includes Keynote Speakers, Tutorial Speakers, Summer School Speakers, etc. For Tutorial Speakers, the Tutorial Chair will take care of the standard process. For Keynote Speakers and Summer School Speakers (if there is a Summer School), the General Chairs or Program Committee Chairs will execute the process. The PC Chairs and General Chairs propose names and also ask the Steering Committee for nominations. The PC Chairs and the General Chairs create the list, and filter out anyone who has been an invited speaker in the past 4 years in PAKDD. The reason for this is to expose the PAKDD community to a diversity of opinions/view/ideas. This also helps to bring PAKDD to the notice of well regarded people outside of the existing PAKDD community, thus increasing its visibility. The PC Chairs and the General Chairs rank the nominated candidates based on (i) their visibility, (ii) relevance of area, (iii) experience in speaking in other forums, etc. The PC Chairs select the top 3 for Keynotes, and 1 for any Data Mining School and send it to the Steering Committee for approval. The Steering Committee can come back to the PC Chairs and the General Chairs with specific advice about exclusions. The Steering Committee, based on feedback from past conferences, recommends the use of the free EasyChair conference system, which is hosted by the University of Manchester Computer Science Department. Simply register at their web site. The PAKDD 2010 committee has also recommended the use of the free and open source SubSift for assigning papers to reviewers. PAKDD2018 used CMT3. Please be sure to ask the submitter of a paper whether the paper is a student paper. A student paper would normally have a student as the first author and would register as a student. The proceedings are published by Springer as part of the Lecture Notes in Artificial Intelligence series. Alfred Hoffman is the Springer contact and can often best be contacted by phone rather than email. The Steering Committee should be listed in the Organisation section. The workshop proceedings are also published by Springer as part of the Lecture Notes in Artificial Intelligence series as a post conference publication. Papers could be available during the workshop to attendees, and the workshop chairs should provide at least an additional review from the workshop presentations. Authors then have an opportunity to resubmit with any small changes for the post conference publication. Past PAKDD conference have had an acceptance rate from 15% to 30%. Do not exceed 30%. Up to 90 papers is the norm. Conference organisers have conflicts of interest whenever they are also authors of papers. The conference PC chairs must not be an author of any accepted papers. Similarly, tutorial chairs can not submit tutorial proposals and workshop chairs can not submit workshop proposals. Also, conference organisers can not present invited/keynote talks. Three and a half days is a good length. The first day is generally for workshops and tutorials. These are run in parallel. Running tutorials in parallel with the main conference presents challenges, so the recommendation is to run them on the first day in parallel with the workshops. The conference reception is often held on the evening of the day of the workshops and tutorials. Many attendees arrive that day. The reception often includes finger food, and often enough to make a light meal, but also allowing attendees to organise themselves to go out for dinner afterwards if they desire. The second day is the opening of the main conference, often beginning with a keynote presentation. The evening is often kept clear for participants to make their own arrangements. The second evening is also often the Steering Committee annual general meeting and working dinner, hosted by the conference. For some conferences the reception is held on the evening of the first plenary day instead of the day of tutorials and workshops. If this is the case then the Sterring Committee meeting is held 40 minutes after the start of the reception. The remaining time is for the SC only to discuss other items and to make decisions regarding future conferences and SC membership. The next year’s conference decision will be announced at the conference banquet. The conference organiser will also make a presentation at the banquet. The third day is often a half day, with an organised tour for the afternoon, followed by the conference dinner. The tour, whilst highlighting regional attractions, is an opportunity for attendees to network and is regarded as a key benefit of the conference. The final day is a full day. Finishing the conference with an invited panel session including the invited and keynote speakers can often be a good closing point. Often something like learnings from the conference and where to now. The aim is to bring everyone together for the end of the conference for a wrap up, and to encourage attendees to remain until the end to avoid the slump in attendance for the final few sessions. It also provides a definite end point, rather than simply fading out! Two Student Paper Awards including complimentary registration for the next PAKDD conference and a $500 (USD) grant to support travel, funded by the PAKDD Steering Committee, selected by the PC. Best Paper Award selected by the PC. This can be split into two awards, one for best research paper and the other for best applied paper or the paper which best demonstrates good research and repeatability (e.g., by making the algorithm available as open source software). A plaque is arranged by the local organising committee to be presented. 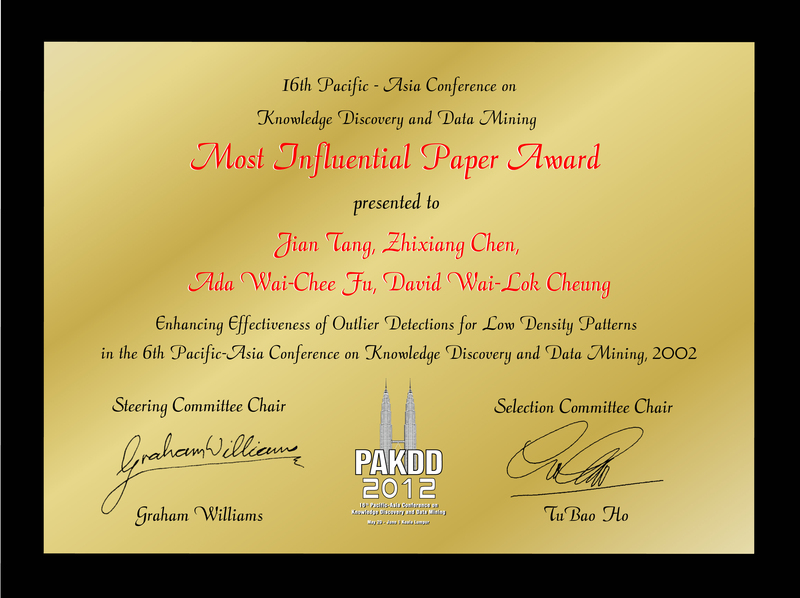 The Most Influential Paper Award is selected from the conference 10-12 years ago by SC awards committee (e.g., in 2012 we selected from 2002). The SC Awards committee convenese in November each year for the next conference. The SC Awards Chair identifies the paper citations using Google Scholar (an automated counter is available) and this may guide the selection of the committee. The most cited papers are reviewed by the committee for impact, influence, novelty, and significance. Recommendations are presented to the SC in January for endorsement and the conference organisers and winner informed in March so that plaques can be arranged and the recipient can arrange travel for attendance. A plaque is arranged by the local organising committee to be presented. The Distinguished Contribution Award is selected by the SC Awards Committee, which is made up of previous recipients of this Award. Once the committee has decided on the recipient, the nomination is presented to the Steering Committee for their endorsement. The recipient is then notified to confirm their attendance at the conference. The conference organisers arrange for a plaque which is presented during the conference banquet by the SC Chair. The recipient is requested to give a short presentation on the past and future of KDD. Student Travel Awards are funded by the PAKDD Steering Committee to support student authors of accepted papers to help them defray part of the cost of attending the conference to present their work. The Student Travel Awards will be presented in cash to the winners at the conference reception. The amount of award for different winners may be different according to the needs of the applicants and the capacity of the fund. Typically, the amount for each award will be around USD $400 with 10 awards available. The awards are administered by the conference organisers. See PAKDD 2015 Student Awards for an example. The plaque used for the major awards is often a golden coloured A4 (297mm x 210mm) plate on a wooden mount. A serious problem is the no-show. Authors have paid their registration to get their paper published, but don’t turn up – they’ve already got what they wanted or else last minute changes of plans have required them not to travel! The main problem here is attendees turning up to a session where only 2 of the 5 presenters have arrived. It looks bad and provides a negative talking point. A simple solution is to delay production of the final progamme as much as possible. Before final printing get confirmation from each author that they can still attend and remove from the programme those who can not.A plaque is arranged by the local organising committee to be presented. Please also refer to the PAKDD No Show policy on the PAKDD Web Site and direct authors to this policy so it is very clear what our expectations are and waht actions the conference organisers will take if the rules are breached. Session charis must be organised prior to the conference and identified in the conference program. Avoid having as a session chair one of the authors of a paper in the session. It tends to make it awkward for the chair to also present a paper. The following may usefully be handed to each session chair. Be sure to remind all speakers during the openning to report to their session 5minutes prior to the session time. Please check “Program” on the Web Page in advance. Your session may consist of long presentations (20min talk and 5min discussion) and short presentations (12min talk and 3min discussion). Come to the room approximately 5 minutes before your session starts, and check that each speaker is in the room. In addition, confirm the pronunciation of the speaker’s name and affiliation. Ask all speakers to copy their slides into the conference provided computers. If you find any problem with the environment of your session room, please contact our volunteer who is in the room. The volunteer is identified by their name badge and t-shirt. At the beginning of your session, inform the speakers of the times allocated to their talks and discussions according to the conference program booklet. Please keep the session on schedule. You are responsible to maintain the schedule accurately. Please let all speakers use the microphone when it is provided. Please take care of the speakers not to hide the screen from the audience. Remind every speaker their remaining time. The presentation of a long presentation-based paper includes 20min talk and 5min discussion, the presentation of a short presentation-based paper includes 12min talk and 3min discussion. Please take note of “NO SHOW” presentations and inform the registration desk after your session. In case that a presentation ends earlier than the scheduled time or is a “NO SHOW”, you may use the extra time for discussions among the audience and yourself, in order to cater for the schedule for the next presentation. Emergency: If there is any urgent business, please contact the volunteer at the conference room, or the registration desk. Transfers to and from the airport can often be organised by the conference and are a welcoming sign to the conference attendees! If other very convenient transfer arrangements are available (e.g., direct link into the local train or bus system and convenient location of a station or stop to the hotel) then that is often adequate and could be clearly noted on the conference web site. These guidelines have been captured over the many years and serve as a guide to conference organizers. Please contact Graham.Williams@togaware.com for inquiries.